Can Leaders be made or they are only born? The debate over this issue has been finding place in the management literature in the last century. The genetic science has reasons to believe that it lies in ones genes how he/she is going to reflect on the work behaviour. However, it is also argued number of times that through education, training and pruning one could transform himself/herself into a successful and effective leader. The difference between effective and successful leaders, between effective and ineffective leader is also an issue which is getting importance in the literature as well as in practice. 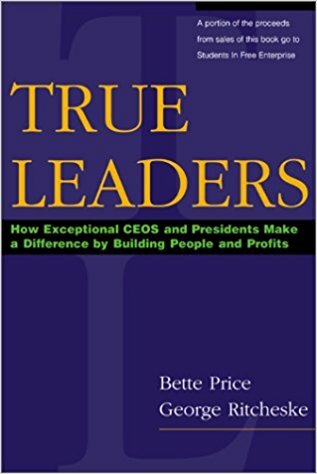 ‘True Leaders is a blueprint for success in an era when a rapidly changing marketplace and an ever changing workforce require integrating human value with economic value to differentiate effective leaders from ineffective leader. The book is an outcome of the interviews with 27 most successful business leaders in the US, coming from diverse group of industries, some held publicly and some privately, some led by men, some by women and some by minorities. These leaders operate with a background of core values which could be translated into good financial performance. These leaders demonstrate great deal of inherent love and caring for their people, which makes them True Leaders. The book includes the leaders like Garrett Boone, Chairman and Cofounder, The Container Store, Terri Bowersock, Founder, Terri’s Consign and Design Furnishings, John Bruck, Chairman and President, BHE Environmental, Inc, James Copeland, Jr, CEO, Deloitte & Touche, Debbie Gaby & Len Gaby, President & CEO, Sleep America, Ann Hambly, MD, Prudential Asset Resources, Frank Hennessey, CEO, MascoTech, Vicki Henry, CEO, Feedback Plus, Inc, Irv Hockaday, President and CEO, Hallmark Cards, Linda Huett, President and CEO, Weight Watchers International, Inc, Jack Kahl, Founder, Manco, Inc, Jack Lowe, CEO, TD Industries, Bill Matthews, Managing Partner, Plante & Moran, LLP, Mike McCarthy, Chairman, McCarthy Building Companies, Inc, Gary McDaniel, CEO, Chateau Communities, Inc, Gary Nelon, Chairman and CEO, First Texas Bancorp, Inc, James B Nicholson, President and CEO, PVS Chemicals, Inc, David Novak, Chairman and CEO, Tricon Global Restaurants, Inc, Dr Alvin Rohrs, CEO, SIFE, Len Roberts, Chairman and CEO, Radio Shack Corporation, Bruce Simpson, CEO, AppGenesys, Inc, Lou Smith, President and CEO, Ewing Marion Kauffman Foundation, Kip Tindell, President and CEO and Cofounder, The Container Store, David Walker, Comptroller General of the United States, US General Accounting Office, Tim Webster, President and CEO, American Italian Pasta Co, and Dan Woodward, Chairman and CEO, Enherent Corp. The book contains 12 chapters and 5 Appendixes. The chapters start with Defining true leaders (chapter 1), considering passion as a prerequisite (chapter 2), See what is not yet visible (chapter 3), care enough to connect and convey (chapter 4), treat learning like dirty dishes (chapter 5), do what's right and tell the truth (chapter 6), trust is a must (chapter 7), recognize and build people (chapter 8), trust your intuition (chapter 9), risk to respond and grow (chapter 10), respect the importance of balance (chapter 11), and, so what? predictions for the future (chapter 12). The leaders who find their views expressed and their values conveyed to their people are effective leaders. After every chapter of the book there are certain questions to be explored and discovered which would certainly help the reader for practical purposes. The book refers to Students In Free Enterprise (SIFE) and draws a lot from their experience. SIFE clarifies its mission as: To provide college students the best opportunity to make a difference and to develop leadership, teamwork, and communication skills through learning, practicing, and teaching the principles of free enterprise. It is a nonprofit collegiate organization in US. Appendix A provides a detailed perspective on the activities of which SIFE carries and their experiences. The book has a leadership evaluation tool as given by Dan Woodward in Appendix B. Appendix C illustrates ‘One-with-One Discussion Card’ used by TD Industries. This card facilitates the discussion between employees and supervisors. This practice is unique in its nature. A concise objective view of the whole book is reflected in Appendix D which consolidates the Attitudes and Values of all the 27 leaders included in the book. This appendix shows ‘the average true leaders attitudes and values graph’. Appendix E provides summarized information with the web addresses of all the companies included in this present work. For readers convenience an index (p 213-219) is provided towards the end of the book and the information about the authors is provided just to wind up the book. The narratives used in the book make it interesting for the readers and the language used is very simple which is easy to follow and we can relate it with our immediate environment. ‘True leaders genuinely care about people. They feel a responsibility to create a work environment in which people are respected and recognized, and they allocate funds to ensure that their people are adequately trained.’(p 129) ‘It’s very easy to get into a trap of focusing on mistakes instead of looking for positive opportunities. 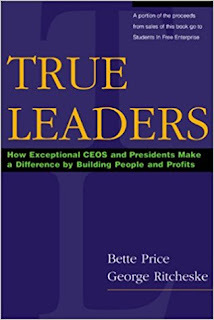 If leaders can shift the emphasis to looking for the things people are doing that are right and for ways to reward doing the right thing by creating opportunities, they serve the organization better and go a long way toward building people.’(p 143) ‘Being committed, accountable, and responsible doesn’t necessarily translate to giving up the joys of personal life. Lou Smith says he loves being at the Ewing Marion Kauffman Foundation, but my life doesn’t end if I’m not here. I, and we as leaders, should not be consumed by the enterprise. We call it balancing life.’(p 169) And to top all this the authors strong belief is "You won't find passion as part of the curriculum at leading business schools, nor will it be listed as an elective. Yet in the real world of true leaders, passion plays an integral role." These are some important pieces I personally like, there are many such pieces which would add lot of value to the reader after going through this book. This is a book which is useful for students, practitioners, teachers and a common man. There are many examples and events which occur in our own surroundings very often, this would certainly help the reader to relate and find out the ways in which he/she can deal with the issue. I recommend this book, written in a very simple manner, easy to follow language, and rich in its academic content, to the students of management and teachers.